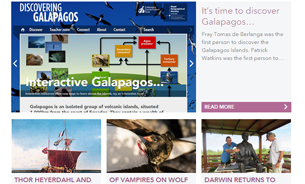 Sign up for free and keep up to date with Galapagos news! Excited about travelling to Galapagos? The Galapagos Conservation Trust is a small, UK-based charity. By supporting pioneering projects across science, education and culture and raising awareness of Galapagos in the UK, we work towards a Galapagos that is protected into the future for the benefit of its unique wildlife and for humankind. Whether you have already visited Galapagos, or are preparing for the trip of a lifetime, we can help you become a Galapagos expert with our regular email updates. If you would like to support our important conservation efforts, please take a look at our membership options.